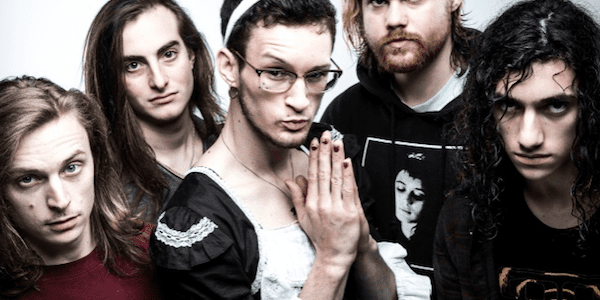 We talk to Max Portnoy of alternative metal act, Tallah about music, gimmicks in music, and more. S] How important is the visual aspect of the band? People seem to be associating us with having a gimmick, but we as a band we aren’t trying to have one. Yeah, our singer dresses how ever he wants but it’s not intended to be a gimmick. If you come out to shows or see footage you would see that he’s always doing something different, he hasn’t worn the same outfit twice. When people see us they instantly see Justin wearing a dress or bunny ears and think that’s our “thing” but it isn’t our “thing”. Justin has only worn a dress once, and at a completely different show he wore bunny ears, and at other shows he’s worn a sweater vest and even just a “normal” outfit! We do whatever we want, and that is our image. Were not sticking to one look, we aren’t sticking to one outfit. Whatever we want to do that night on stage is what we do, whether it is what Justin wears, how we act on stage, how we interact with the crowd. Every show is different, and that’s what makes us interesting, in my opinion. S] What have been some of the biggest challenges for the band recently? The biggest challenge right now is to get our name out there, and for people to get what were doing. So far we’ve gotten tons of coverage from big sites and pages and some people tend to not look more into the band than our promo pic. As of right now, playing shows has been absolutely amazing and we have received tons of positive feedback and made many fans at these shows. So playing out seems to be working really well for us and we are trying to book up some tours to get our name out there even further! S] What inspires the band outside of music – think specific people and places? Besides music, the band is inspired by quantum physics, Chaos Theory, and thought patterns repeating themselves so many times that they manifest into a physical plain. S] What have your learned about yourselves as musicians (and people) through the music that you’ve made? Personally, I have learned that you need to push yourself to the limits live. There’s no excuse for standing on stage and just playing music, nobody wants to watch that, at least in this genre. For me, and this band for that matter, we don’t feel like we had a good show unless we feel physically beat once we get off stage. Obviously the music needs to sound good, but that’s only half of it. We strive to play our parts the best we can, just like the recordings, while giving it our all on stage. I’ve never put this much energy into my music before, but now that I do, I can see the impact it has. I get off stage feeling like I put on the best show I could, and so far everyone who is there tends to be way more into it themselves when they see us giving it our all. Its made playing show so much more enjoyable for me, because its a whole new aspect of playing out. You need to play good and tight for obvious reason, but if that was all I did, I would never be happy. S] What are your goals for the rest of the year? 2018 is going to be a super productive year for us. We plan on releasing an EP that we have recorded and is in the works, we’ve been playing all these songs live at our shows. We will also be trying to get on as many tours as possible, and get out there as much as we can. None of us want a single day without playing a show, so the more we can get out there the better. If you’re in a band and want an opener, SIGN US UP! We will be updating our social media pages with dates as they come. We are on Facebook, Instagram, Twitter, and YouTube. S] What would you like your legacy to be as a band? It would be pretty cool for people to Google search “Tallah” and not have all the search results be “Did you mean Tallahassee Florida?”. Thank you for your time!